Edition Limited to only 495 in the World! sell to highest bidder. I am not obliged to have the auction run for the full number of days. HAS BEEN SOLD OUT FOR YEARS! +++ "Snow White Discovers the Cottage" is the first painting in Thomas Kinkade's new Disney series entitled "Timeless Disney Moments". +++ Thomas Kinkade worked on this masterpiece for two and a half months, spending hundreds of hours to create a timeless fairytale image. This first image in the series honors two of Thom's greatest ideals-home and family-and the spiritual sense of the destiny that we all possess-returning home. Snow White has just found her true family and safety, and is at peace with nature. Thom has also included in the image as a symbol of wisdom. +++ Thomas Kinkade has hidden a total of seven N's as a tribute to his wife Nanette. +++ To honor this new collection of Disney favorites, there are also seven Mickey silhouettes hidden in the image --One for each Dwarf. 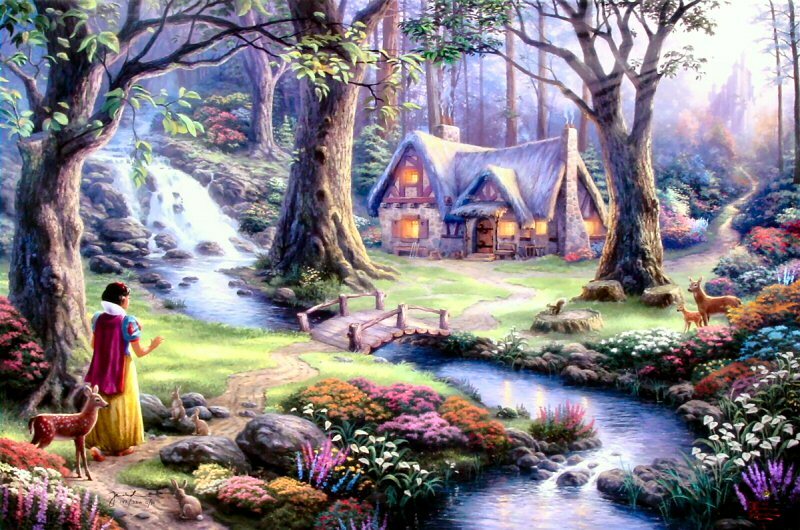 Snow White Discovers the Cottage is the first painting in Thomas Kinkade's new Disney series entitled Timeless Disney Moments. 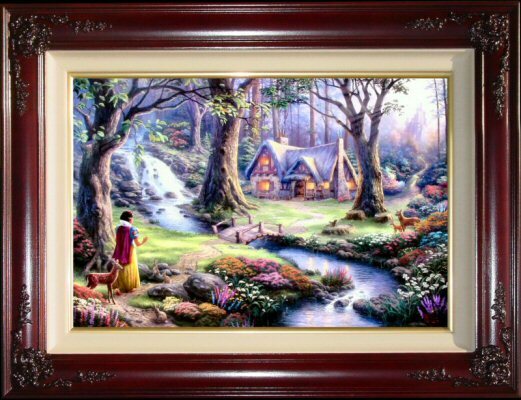 ++++ Brass Plaque with the legend "Snow White Discovers The Cottage ~~Thomas Kinkade"
I hope that Snow White Discovers the Cottage will be a fairy tale come true for Disney and Kinkade collectors everywhere." ~~~ Snow White and the Seven Dwarfs, based on the European fairytale by the Brothers Grimm, originally premiered in 1937 and is the first feature-length animated film with optical sound in movie history. It's also the first Walt Disney Animated Classic. ~~~ Snow White and the Seven Dwarfs became a major box-office success. For a time, it was the highest-grossing film in American cinema history. Adjusted for inflation and subsequent releases, the film still registers one of the top ten American film moneymakers of all time. The film received a standing ovation at its premiere from a star-sudden audience that included such celebrities as Charlei Chaplin and Shirley Temple, among many others. ~~~ Snow White and the Seven Dwarfs has been ranked by the American Film Institute as the greatest animated film of all time!